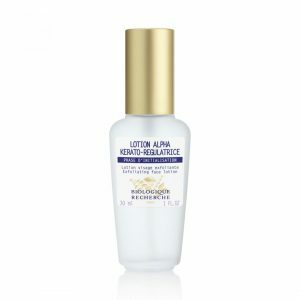 Lotion Alpha Kérato-Régulatrice, our at home facial booster, is suited to our most avid of clients that would like to step up from our Lotions P50. This powerful lotion combines all the benefits of purifying, exfoliating, moisturising and toning, which all help to rebuild the epidermal barrier. The strengthened epidermis fully fulfils its protective function and promotes the skin’s self-renewing potential. Due to its composition of fruit acids, this anti-ageing lotion will refine the skin’s texture, reduce skin imperfections linked to the female cycle and improve the efficacy of lightening products applied afterwards, for a smoother and brighter skin. This concentrated lotion also increases the amount of Natural Moisturising Factors (NMF) in the epidermis, which improves the hydration level. Thick and dull Skin Instants®. Renovating and exfoliating agents: Fruit Acid Complex containing Apple, Grape, Ginger and Sugarcane. Moisturising agents: Natural Moisturising Factors (NMF).